Syfy have released a trailer for their adaptation of George R.R. 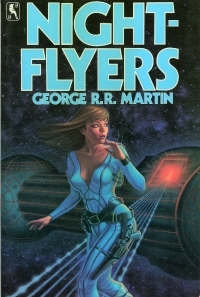 Martin (Game of Thrones) book, "Nightflyers", based on Martin's novella. Blending horror and sci-fi, Nightflyers is a haunted space ship yarn in the vein of Event Horizon. Nightflyers was previously adapted as a feature film in 1987. NIGHTFLYERS follows eight maverick scientists and a powerful telepath who embark on an expedition to the edge of our solar system aboard The Nightflyer – a ship with a small tightknit crew and a reclusive captain – in the hope of making contact with alien life. Nightflyers premiers in the Fall.